Mary ****: "Good supplier quick response." Peter ****: "Awesome deal, well packaged and quickly delivered. Great product. Happy to deal with FastBikeGear again any day." Cyril ****: "Oiler installed and running just as described. A great buy." 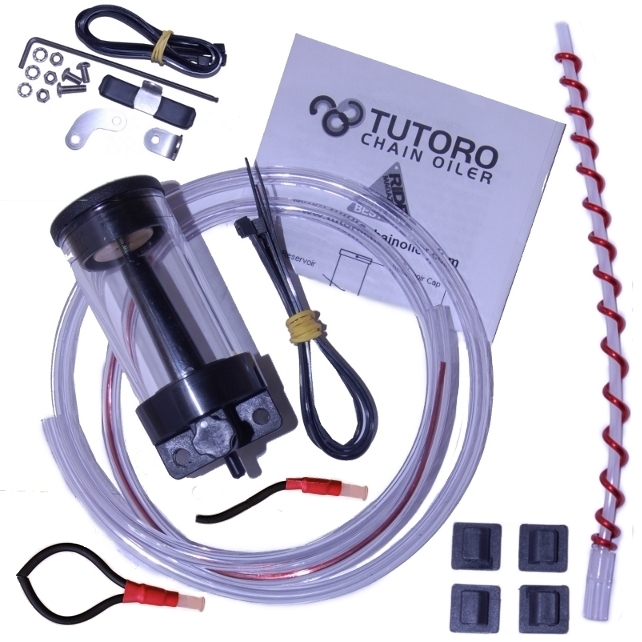 Jeff ****: "Bought this TUTORO Chain oiler off FastBikeGear. Had heard alot about these units but was still surprised at the quality of build, looks great. Would highly recommend to anyone thinking of getting an oiler. Cheers Jeff." Jared ****: "My Hyosung GT250R is running a Tutoro Auto chain oiler, best investment I have ever made for my commuter bike with 22,000km on the new lube device I have no wear on the chain (2,000km old at time of Tutoro fitment & was being spray lubed) & it is clean almost all the time, I have not cleaned the chain since the day of fitment & it was being used in all weather in all seasons but yet it remains spotless from running a setting that keeps the chain a tad wet (Very minimal fling onto the tyre. My SV1000S is running a Scottoiler which is not bad but has had to be re-bled a few times due to it's position (Mainly due to bulkiness) & is certainly not as easy to fill, this unit will likely be removed in favour of the Tutoro Auto due to its simplicity, quality componentry & long range capacity." Steve ****: "Everything OK, reliable seller." Ernie ****: "Great dealer very friendly." Reece ****: "Great supplier, easy to deal with, Thanks Heaps Reece." Stu ****: "Very good company to deal with, very prompt, good product thank you." Jeff ****: "Bought this TUTORO Chain oiler off FastBikeGear. Had heard alot about these units but was still surprised at the quality of build, looks great. Would highly recommend to anyone thinking of getting an oiler. Cheers Jeff." .. Item received and now fitted, works very well and fitment was easy. Cyril ****: "Oiler installed and running just as described. A great buy." ..